A robber who ripped chains from the necks of pedestrians on the streets of Sheffield in a two-month rein of terror has been jailed for nine years. Joel Jan Fletcher, aged 21, stole gold chains worth £1,700 from eight victims he targeted in Hillsborough between February and April this year. One victim – a 60-year-old man – was robbed as he waited at a bus stop on Middlewood Road. In another incident, Fletcher snatched a chain worth about £400 from a 62-year-old woman as she walked along Holme Lane. He even snatched a chain from a woman who was walking along with her daughter – who was celebrating her brithday. 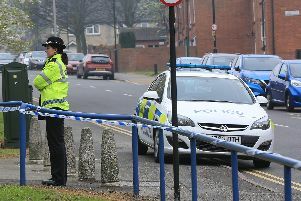 South Yorkshire Police said the robberies had traumatised some victims, leaving them frightened to now walk the streets alone. Fletcher, of Burngreave Road, Burngreave, was jailed after admitting three of the eight robberies and two burglaries. Detective Constable John Bowerman, who led the investigation into the spate of street robberies, said: “This is a great result and a testament to the officers involved in the case. “These incidents were traumatic for the victims and many had sentimental items taken from them. “On one occasion, Fletcher stole a chain from a victim as she walked home with her daughter, whose birthday it was that day. “His actions have had a real impact on the victims’ lives and in some cases has affected their confidence to go out alone. Five of the eight robberies Fletcher failed to admit will lie on file. Sheffield Crown Court also heard Fletcher stole a haul of electrical items from a house on Bower Lane, Grenoside, and climbed through an unsecure bathroom window of a house on Foxhill Close, Burley Edge, to steal eight watches worth £300 and an eternity ring worth £80.